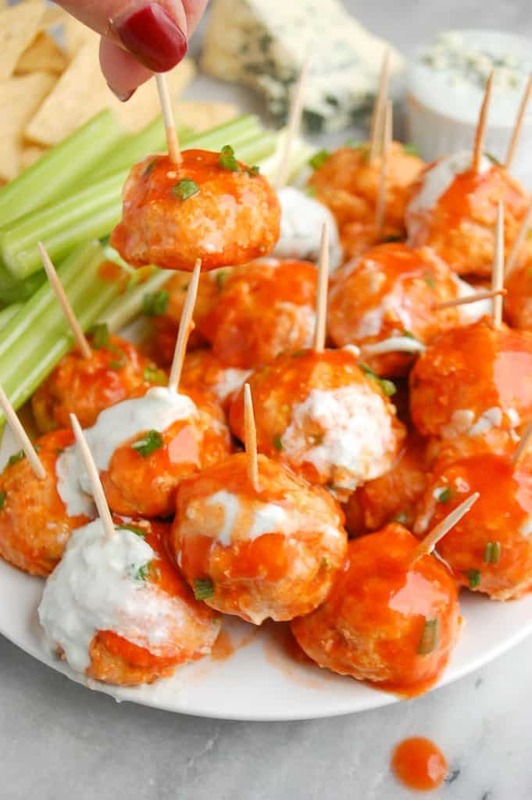 Six ingredient Buffalo chicken meatballs make the perfect game time appetizer! These are a healthy whole30 and paleo version made with minced green onion, almond flour, and buffalo sauce, topped with a homemade blue cheese dressing. 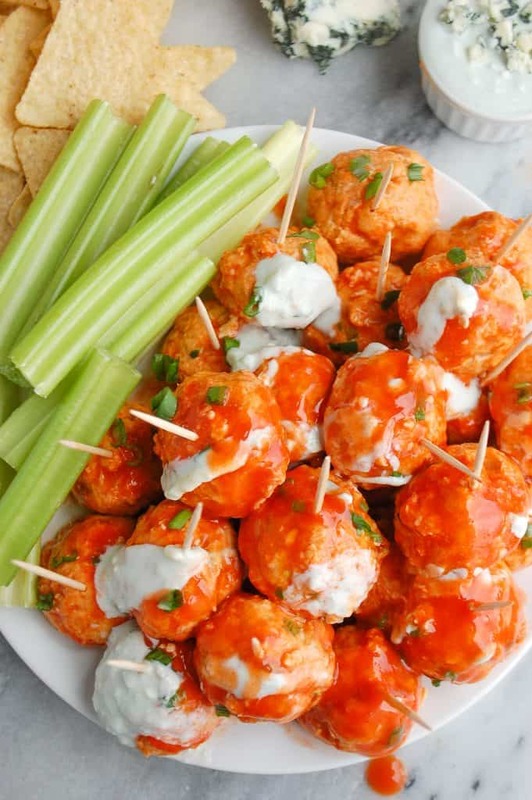 If you love buffalo chicken wings, but are looking for a healthier appetizer for football season, look no further because I have some of the best buffalo chicken meatballs you could ever ask for! Plus, without the whole mess of having to dive into wings with your hands. We have been absolutely devouring these over football season in our house and let’s just say we have had a lot of football between college football, Tom supporting a separate NFL team than me, and then my team of course! Go Eagles! So with a lot of football comes a lot of really good food. That’s kind of like a necessity for football season isn’t it? Pizza, wings, and all of the unhealthy finger foods just make the whole game so much better and more enjoyable. 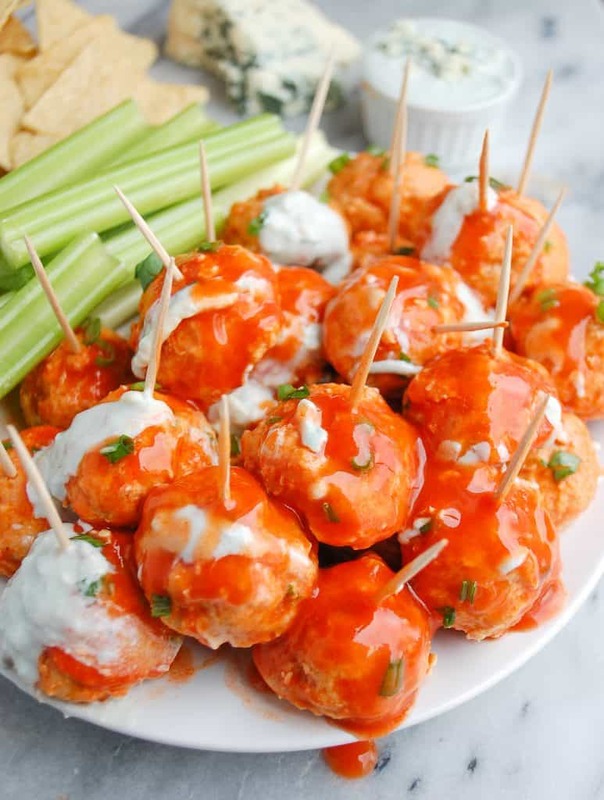 In an attempt to make some of these a little bit healthier, I started with my boyfriend’s favorite combination of food: buffalo chicken! He is obsessed with buffalo chicken everything, and I don’t blame him. Anytime there is a buffalo chicken anything on the menu, he automatically will order it and so I figured I should try to make him some healthier versions. 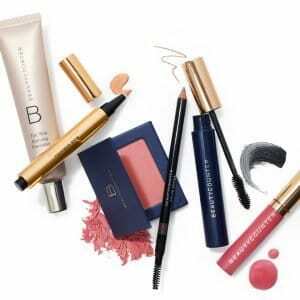 I brought these to our New Year’s Eve party and everyone loved them so much, so I knew they were a winner! I also brought a healthier buffalo chicken dip and avocado feta dip— I told you I was seriously on the buffalo chicken train. That recipe was posted last week and the best ever avocado feta dip is located right here. It also got me thinking about what other foods I should make healthier versions of…if you have any ideas, you can always send me a suggestion! 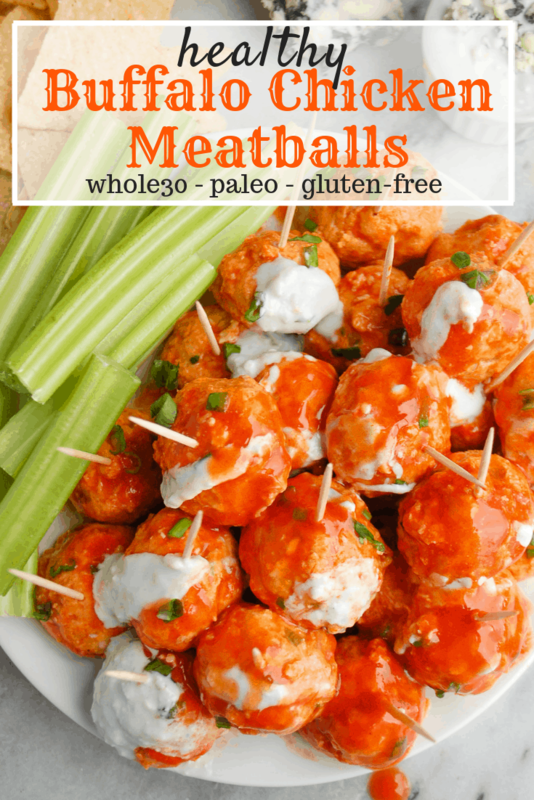 Without even really trying either, these buffalo chicken meatballs are completely paleo and whole30 approved, so if you’re doing one of those diets, you are in luck! They are made with minimal, wholesome ingredients, yet still pack a mean flavor punch. 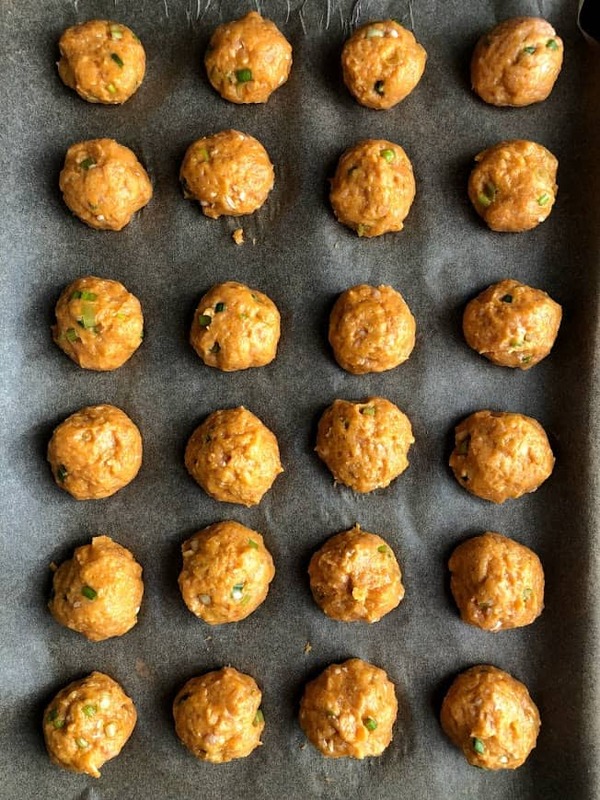 For these buffalo chicken meatballs, all you need is ground chicken, some hot sauce, green onion, one egg, almond flour, and garlic powder. That’s it!! So simple and so delicious. 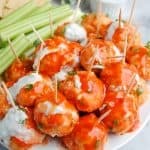 Hope you enjoy these buffalo chicken meatballs, and if you make them, be sure to share a photo with me!! CONNECT WITH ERIN LIVES WHOLE! In a large bowl, mix together chicken, egg, almond flour, 1/3 cup hot sauce, green onion, and garlic powder. I used my hand to do this! With about 2 tablespoons of meat, roll into balls and place on baking sheet. Bake for 18 minutes at 400. Take out of oven and let rest for 10 minutes. Toss in 1/2 cup of hot sauce. For the blue cheese dip: whisk all ingredients together in a bowl. Serve blue cheese dip alongside meatballs or drizzled on top. Sign me up for new recipes to my inbox!